Peter popped up last year on my radar. A fellow Finn, living in Turku, and a disciple of light gear - with the addition of a bicycle. One of the persons responsible for me deciding to join the bikepacking movement. Yes, Peter is a guy to look out for, and adds a formidable blog to the nordic lightpacking movement. 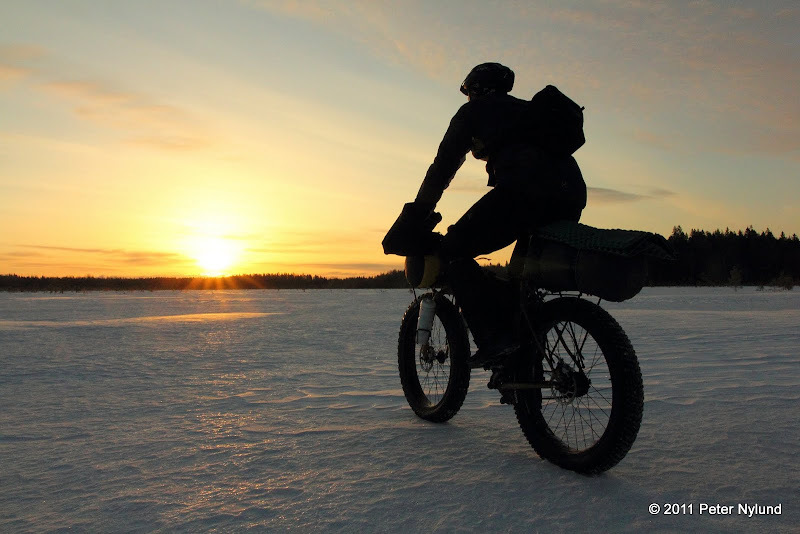 After he introduced you to Bikepacking in Finland here, go and read his blog Yeti Rides and follow him on Twitter. The usual first mountain bike is a hardtail, i.e a bike suitable for terrain use with front suspension only. Hardtails are usually less expensive and lack the somewhat complicated rear suspension. A suspension seatpost might be added to save the back from the worst bumps. There are two main options for wheel size: The traditional 26" mountain bike or the newer 29" wheel size. The wheel size is still a source of religious debate, but the consensus seems to be that the 29" wheel size offers advantages for bikepacking, unless the rider is very short. 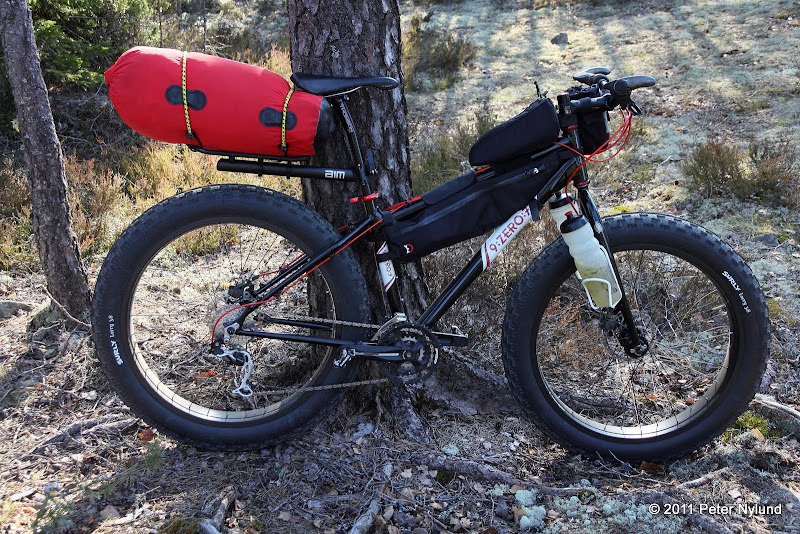 This bike type is very suitable for bikepacking and allows packing gear on the bike instead of in a backpack, should that be preferred. As the name implies, these have both front and rear suspension. They come in either 26" or 29" wheel size. On very rough terrain, full suspension bikes ride a lot smoother than the other bike types. The amount of suspension is an important parameter for the purpose of the bike. A general rule is that more suspension makes the ride smoother at the cost of taking more energy to ride. For bikepacking purposes a more modest amount of suspension (100-140 mm) is usually best. Full suspension bikes often force you to pack most of the gear in a backpack. This bike type is more expensive than a corresponding hardtail. The preferred way among many bikepackers is to add some extra bags to the bike itself, and then complement with a backpack if necessary. The heart of this system is a frame bag, which fits into the main triangle of the bike frame. A full suspension bike does not usually have a large enough main triangle to allow a useful frame bag, but other bike types do. A large frame bag could provide room for up to 10 l of storage in a very good place: The center of gravity is very low and therefore packing heavy items in the frame bag does not affect the bike handling much. Custom made frame bags of very high quality are available from Revelate Designs and Carousel Design Works, but you could also make one yourself. I've made two and they both work very well. Light and bulky items could preferrably be put in a seatbag. Heavy items might affect the stability of the seat bag and the center of gravity is also unnecessarily high for heavy items. An alternative to a seatbag is light rear rack and a drysack. Especially in larger frame sizes this makes the weight sit a bit lower, but there is a slight weight penalty. Bikepacking requires some special gear in addition to a bike. A helmet is a cheap and necessary insurance against possible head injuries. Cycling clothes, especially bike shorts with a good chamois, make life easier. Good gloves are also worth having, and special bicycle shoes with corresponding clipless pedals make riding the bike easier. A small set of bike repair items is also necessary to have. Fixing a flat tire is something every rider should be prepared to do, no matter how short the ride is. That means carrying a spare inner tube, tire levers, a pump and tools to remove the wheels. Some tire patches are also worth having. Additionally, chain connectors and a bicycle multitool belong to a basic repair kit. 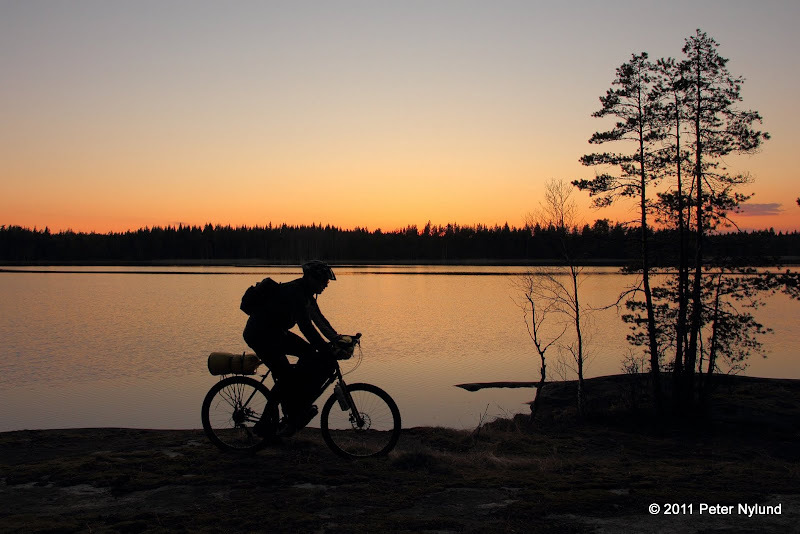 The rest of the gear necessary for bikepacking is the same lightweight or ultralight outdoor gear that is familiar to readers of Hiking in Finland. Bikepacking opens up a whole lot of opportunities over backpacking. The everyman's right allows you to ride just where you can walk, but in practice you would and should stay on trails. National parks might have their own rules, though, so it is worth checking it in advance. In addition, common sense should be used and the trails avoided when they are too soft and wet. Most of the outdoor and wilderness areas in the southern part of the country are fairly small and fragmented. Often the routes contain longish (at least it feels like that) stretches of forest roads, which really are rather boring to walk on. A 10 km forest road section is however no problem when riding a bike, since you move four times faster on it with a bike. On the other hand, on forest trails the speed difference is a lot smaller, meaning the interesting parts still last long enough when riding a bike. The northern part of the country provides opportunities for longer unsupported bikepacking trips in more interesting terrain. There is a network of (poor) doubletrack and singletrack trails in the Hetta-Pˆyrisj‰rvi region of Lapland, which are very suitable for real bikepacking. Joonas Liukkonen and Tapio Huttunen have some bikepacking ride reports in Finnish about this area. Kaldoaivi is another option a bit further to the north. A bikepacking report from Kaldoaivi can be found here. I personally have plans for a week of bikepacking in Lapland this summer, but the exakt destination is still somewhat unclear. Winter bikepacking is an activity of its own and would need a separate article. The winter does however offer opportunities for bikepacking, especially with a fat bike. There are snowmobile trails in Lapland and other places that can be ridden with a fatbike and the sea ice often has a fairly thin layer of snow. If the conditions are right in March, the snow crust can be strong enough for a fatbike in open places such as bogs or fjells, making rather extraordinary trips possible. For the most part, information about bikepacking is fragmented in various bicycle forums and blogs that can be found through a Google search. Bikepacking.net is the only site dedicated to bikepacking, but the number of visitors could be higher.